Penang reveals its food treasure in many ways. Sometimes you will rave about it. Other times you are just fascinated but the types of dishes presented. And although it might not be the best dish you ever had, you are pleased to have tried something new. To have expanded your palate. Penang really lives to its title as the Food Capital of Malaysia. It offers amazing and surprising dishes at each and every street corner. 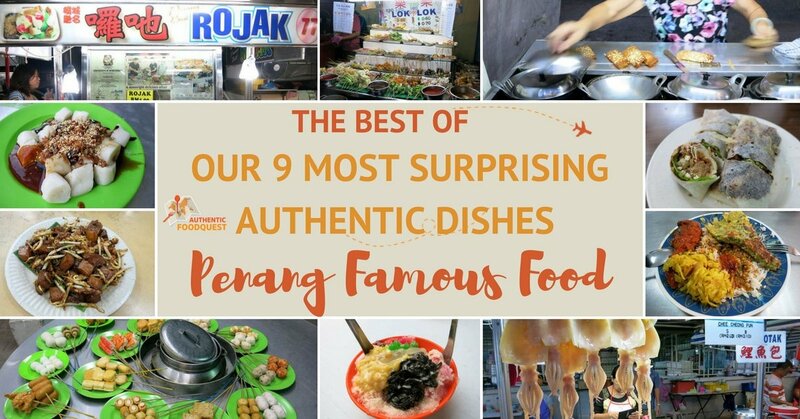 Join us on a tour of Penang famous food and our 9 most surprising authentic dishes. 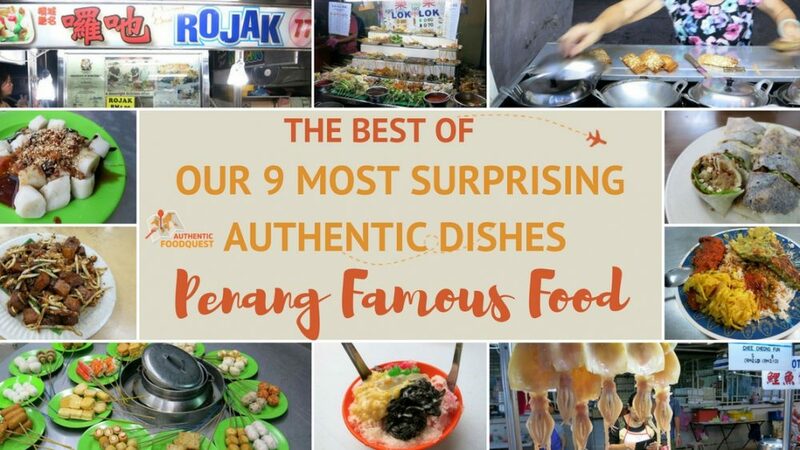 This is part 2, following our first article our 9 most beloved Penang food. Popiah or fresh spring rolls are a healthy and popular local snack. You’ll find them at most hawker centers and they are perfect to enjoy as an appetizer before your meal. 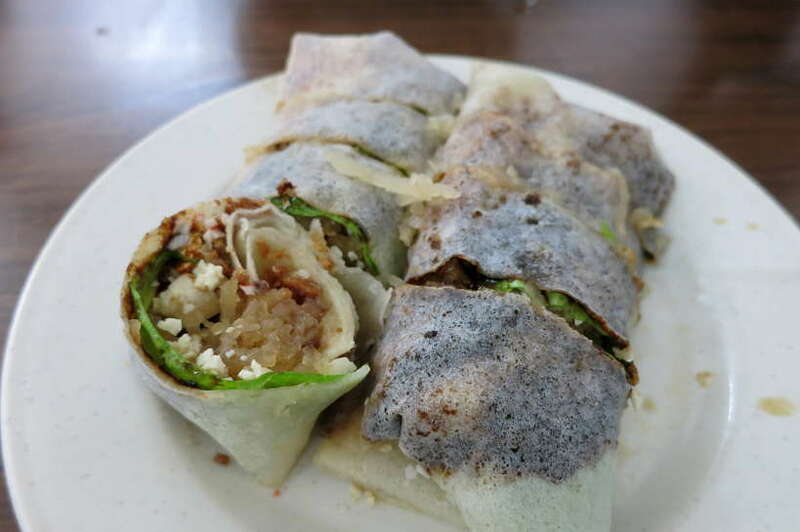 The outer layer of the spring roll is made of a very thin paper crepe made from wheat flour. The inside filling tends to be fresh, steamed or stir-fried turnips, jicama, bean sprouts, carrots, lettuce, sliced tofu, chopped peanuts, fried shallots and shredded omelette. These are delicious and light snacks that we enjoyed and ate frequently. In the core zone of Georgetown, right off Penang road is the very popular Joo Hooi restaurant serving local Penang foods. Depending on what time you get there, you may find a long line. Take your place in line and wait, the food is good and worth the wait. This unique dish is a fruit salad, with the most peculiar and diverse ingredients we’ve ever had in a fruit salad. 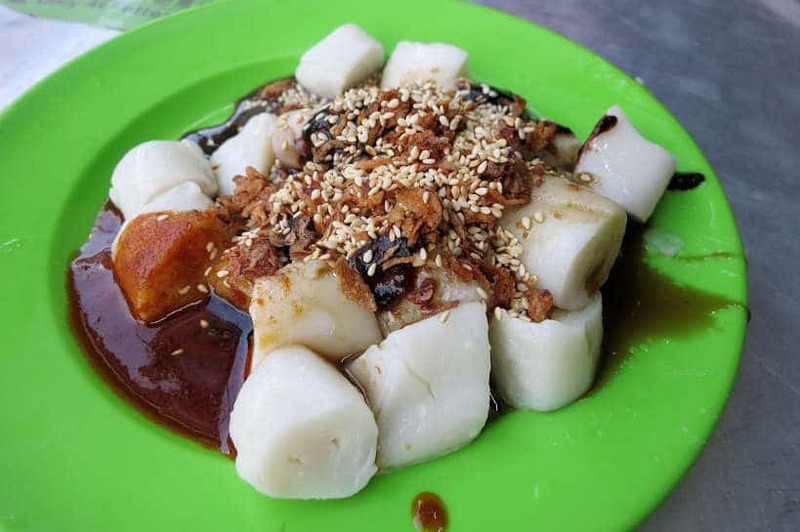 A Penang style rojak typically has cucumber, pineapple, mango, rose apple, cuttlefish, turnip, bean sprouts, taupok (puffed soya bean cake) and youtiao (fried dough fritters). The dressing is really dark in color and is made with a dark prawn paste (Hae Ko), palm sugar, sambal (ground chilies), and lime juice. The fruits are cut into small bites portions and tossed in a bowl with the dressing and mixed together. The salad is topped with chopped peanuts and it makes for a satisfying snack or meal. The first couple of bites took some getting used to. The expectation is a sweet taste because of the fruit, but the reality is salty/sweet flavors due to the pungent dark shrimp paste. 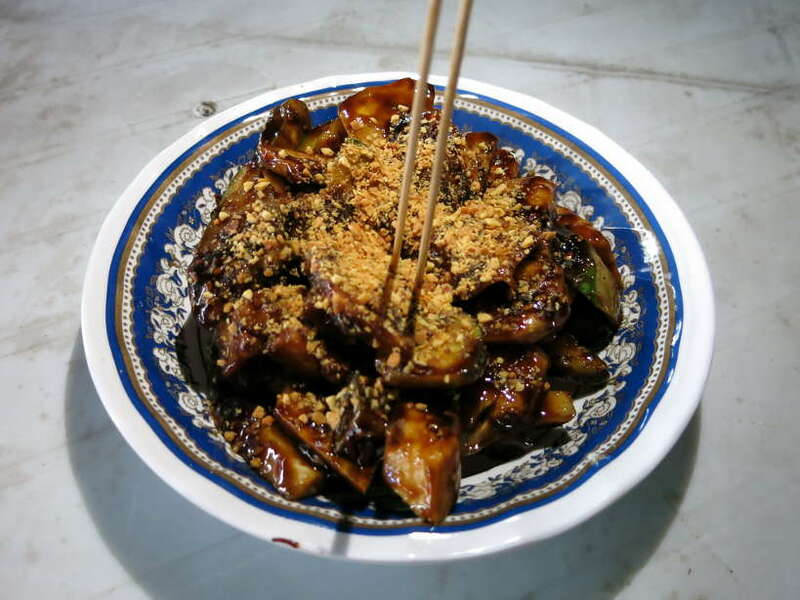 Rojak is eaten with thin wooden sticks that look like skewers and dipped into the sauce. Rojak, is a Penang famous food found everywhere on the island from hawker stalls to fancy restaurants. This dish is representative of the diversity found in Malaysia. It isn’t just a bizarre mix of ingredients, but a dish the different communities have contributed to. The shrimp paste is said to be Malay, the youtiao (fried dough fritters) is the Chinese contribution and the chili paste comes from the Indians. An amazing and delicious concoction of flavors. You will find rojak everywhere and every Penangite has their favorite spot. The secret to a good rojak lies in the sauce. Listed below are places where we tried rojak. Each place was quite good and the ingredients varied slightly. 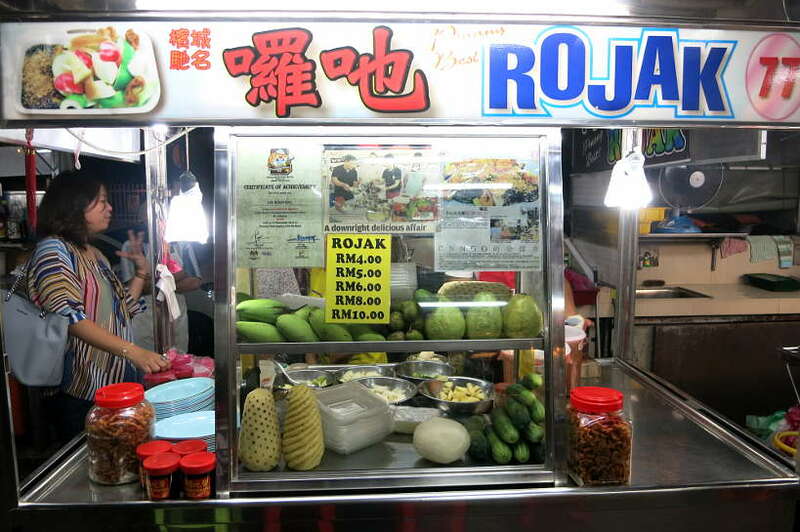 Regardless of where you choose to have rojak, be sure not to miss this popular and Penang famous food. Chee Cheong Fun is a dish from the Southern Chinese province of Guangdong and Hong-Kong. It was brought to Malaysia by Chinese immigrants at the end of the 19th century. Chee Cheong Fun means rice noodle roll. 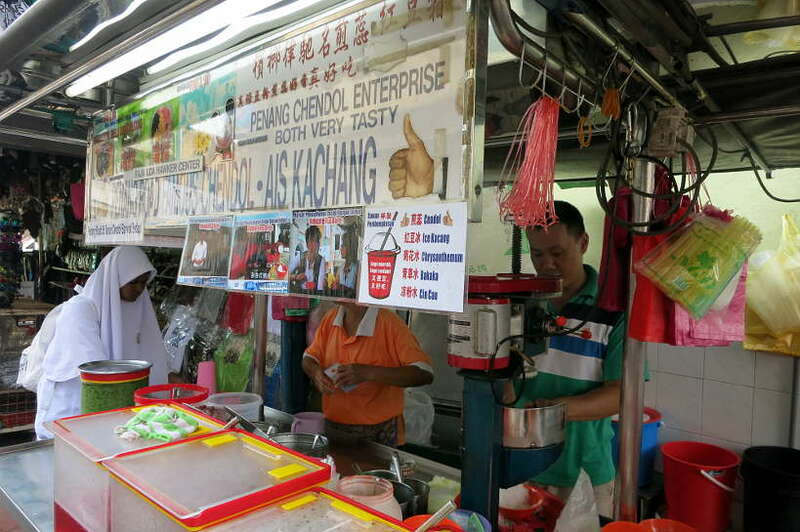 It is a popular street food in Malaysia with the Chinese ethnic groups. In China, it is typically served with soy sauce, whereas in Malaysia the sauce has been adapted and you’ll find various sauces. In Penang, it is typically served with a dark-brown prawn sauce called Hae Ko. The dark sauce over the white steamed noodle rolls makes for a surprising presentation. The texture of the rolls is quite smooth with a sweet rice aroma. The sauce is definitely strong and takes over the flavors of the noodle rolls. Some Chee Cheong Fun are served with a sprinkle of sesame seeds. 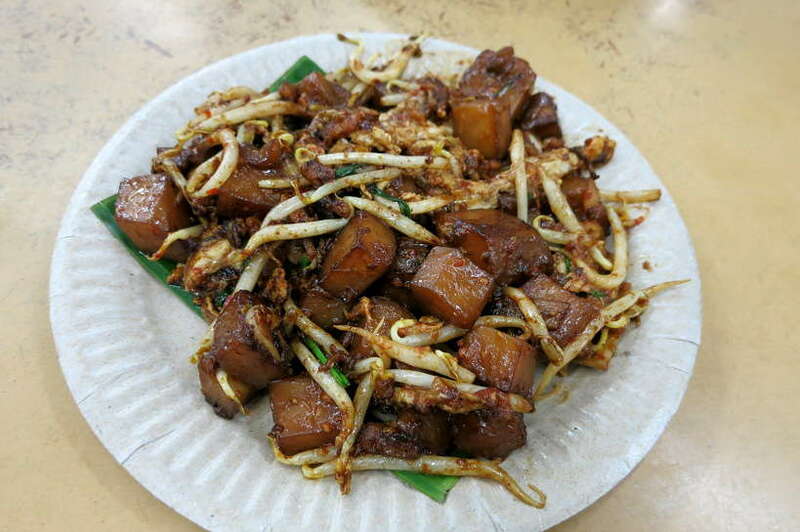 You will find this popular dish served as a snack or a meal in many hawker centers in Penang. Any Chinese type of hawker stalls will have this dish available. This dish is certainly a not to miss in Penang although it was far from being our favorite. The rolls by themselves are blend and when eaten with the sauce, it is hard to distinguish any particular flavors but the strong pungent hae ko sauce. It is definitely an interesting dish to experience and it stretch to your senses beyond anything you know! Address: Chulia Street Hawker Center, George Town. Hours: Everyday, 6:00 pm – 12:00 am. 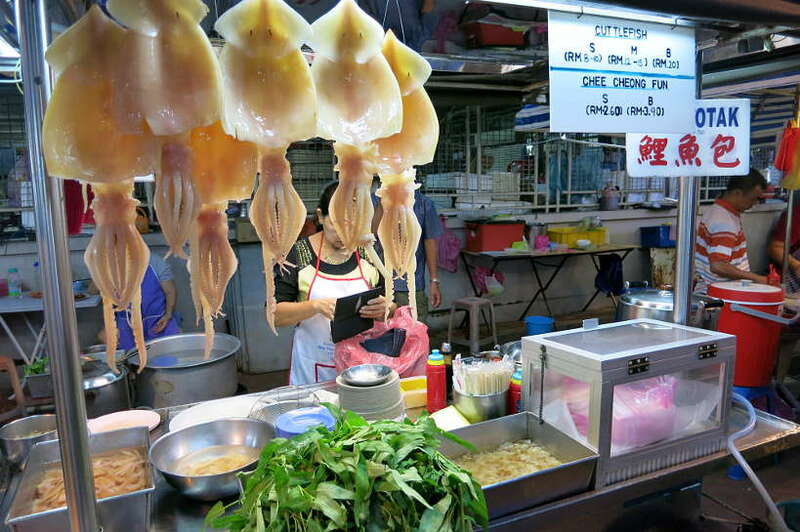 Chee Cheong Fu Stall serving enormous cuttlefish! 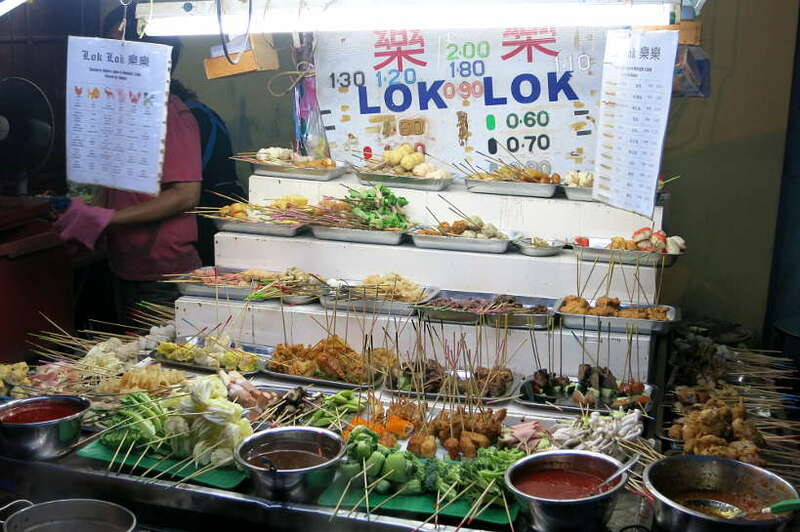 Lok Lok, which means “dip dip” is another Penang famous food not to be missed on your trip. This is a communal type of dinner where locals sit around a table with a central pot of boiling water. A wide selection of food ranging from seafood to meats and vegetables is skewered on sticks and placed around the table. The skewers have different colors which reflect the price of the ingredients. You simply grab whatever sticks you want and dunk them into the pot to cook. 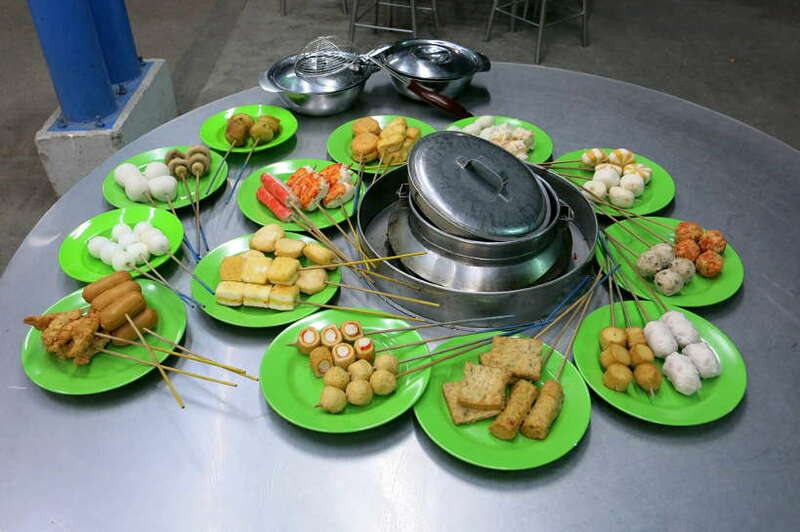 Most Lok Lok items are processed meat such as meatballs, fish balls and crab sticks. However, you can also find a handful of fresh seafood such as shrimps, squids, cuttlefish, etc, and fresh green vegetables. Once the skewers are cooked in the boiling water, they are dipped in a variety of sauces that come with the dish. We are not fans of processed meats, so we did not really enjoy those particular skewers. We prefer fresh ingredients and enjoyed the seafood skewers dipped in the delicious sauces. The experience is perfect when traveling in groups. Choose skewers with fresh ingredients and enjoy a authentic Lok Lok experience. Padang Brown is one of the oldest hawker centers in Penang. It’s been serving Penang famous food since the 1960s. 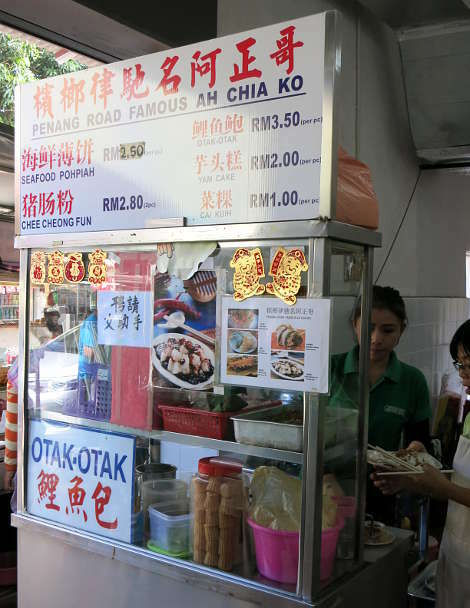 Find many delicious Penang street food as well as the noteworthy Lok Lok stall. Nasi Kandar is another Penang famous food that is well loved in the country. In Malay, nasi means rice and kandar refers to old pole baskets that food was delivered in. The dish is made up of steamed rice, accompanied by a variety of curry based meat dishes and vegetables. In Penang, you’ll find Nasi Kandar restaurants all over at practically every corner. 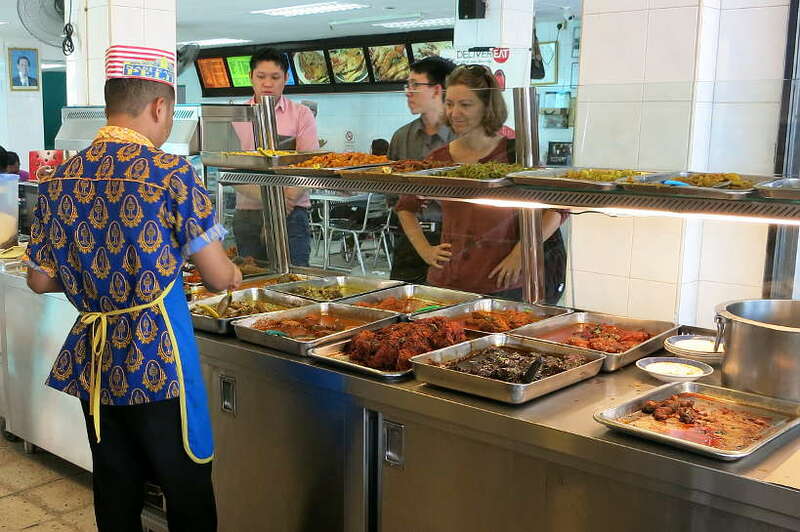 What’s great about the Nasi Kandar restaurants is that they are set up buffet style. You get a plate of fluffy white rice and then choose from an assortment of Indian curries and side dishes. While you can order off a menu, it’s much more interesting and tantalizing to go up to the glass counter and choose your curries and sides. This way, you also get to interact and ask questions about the spicy levels of the curries and the different vegetable side dishes. One particularity of eating at a Nasi Kandar is “banjir.” This is the beautiful combination of flavors when the different curry sauces are poured over the rice. They all mix together creating a wonderful medley of flavors to the rice. We really enjoyed the variety of flavors found at a Nasi Kandar. Don’t miss this experience on your travels to Penang. While you’ll find many Nasi Kandar restaurants all over. 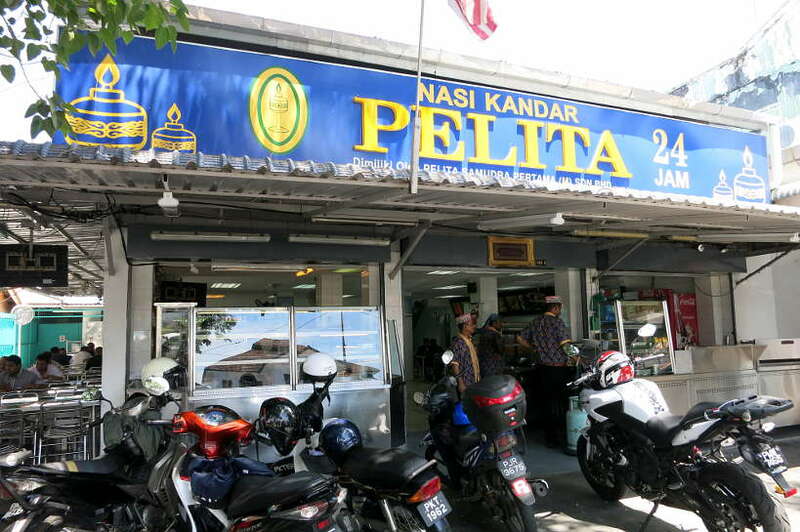 One of our favorite places was Nasi Kandar Pelita which was close to where we were staying. While we didn’t visit this particular Nasi Kandar location, we highlight it here because it is a local favorite and also the oldest Nasi Kandar restaurant in Penang, since 1907. 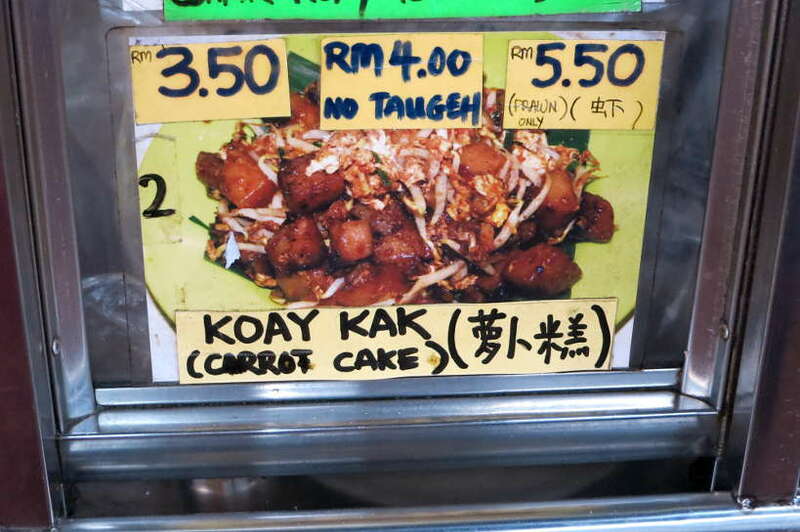 Char Koay Kak is also referred as the carrot cake. But don’t be mislead, this dish has nothing to do with a carrot cake! It is neither sweet nor made with carrots. So where does it gets its name from? Char Koay Kak is fried radish cake. The name is believed to come from the loose translation from Hokkien to English of “radish pastry” called “chai tow” carrot or radish, and “kway “ cake. Char Koay Kak is made of fried radish cake which contains steamed rice flour, water, and shredded white daikon, a mild-flavored winter radish. It is stir-fried with eggs, preserved radish, bean sprouts, soy sauce and other seasonings. The name of the dish and the texture was really surprising. We didn’t find the radish cake having much taste. Nevertheless, it is worth a try to understand what a carrot cake is in Malaysia. This dish is really popular at breakfast or for dinner. You will find it at stalls serving Char Koay Teow in hawker centers. It was hard for us to choose this dish over the delicious and famous Char Koay Teow. Nonetheless, it is worth the experience! 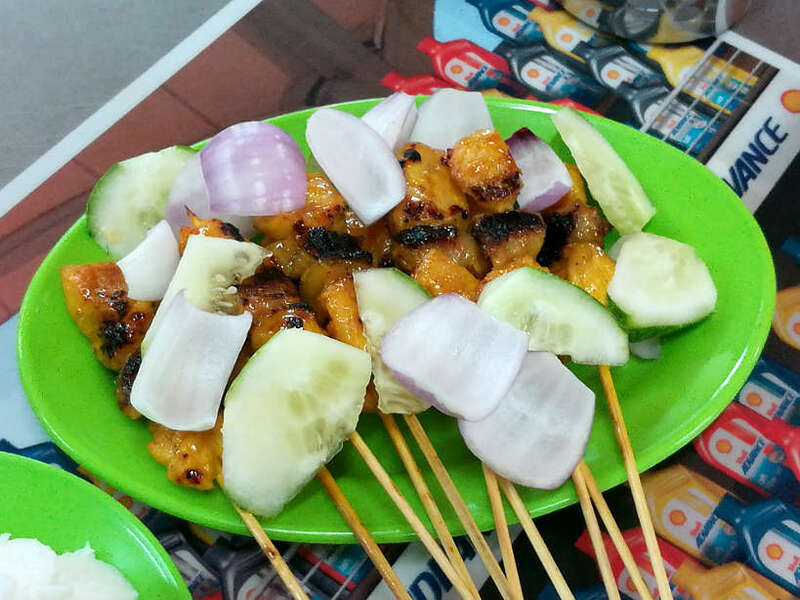 Satay is a popular Penang street food and found all over. 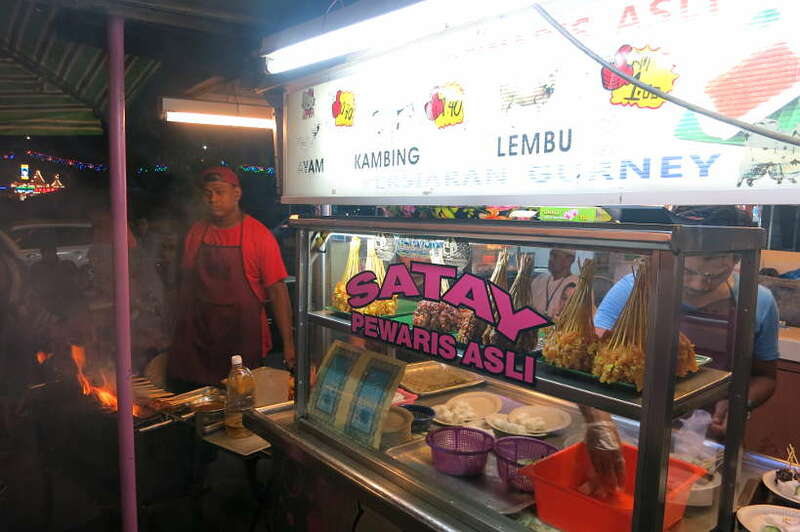 At Muslim Malay stalls, you’ll find beef or chicken satay. When the Chinese cook satay, they tend to prefer pork satay. Good satay is cooked over charcoal which gives the meat a unique smoky taste. Succulent, tender and slightly charred, a good satay is grilled to perfection in the hands of an expert. We enjoyed excellent chicken satay, served with dipping sauce and slices of cucumbers and onions. The satay is sold by the stick. It is very inexpensive, so order at least a dozen and enjoy the tasty and succulent flavors. The iced desserts in Penang took us by surprise. 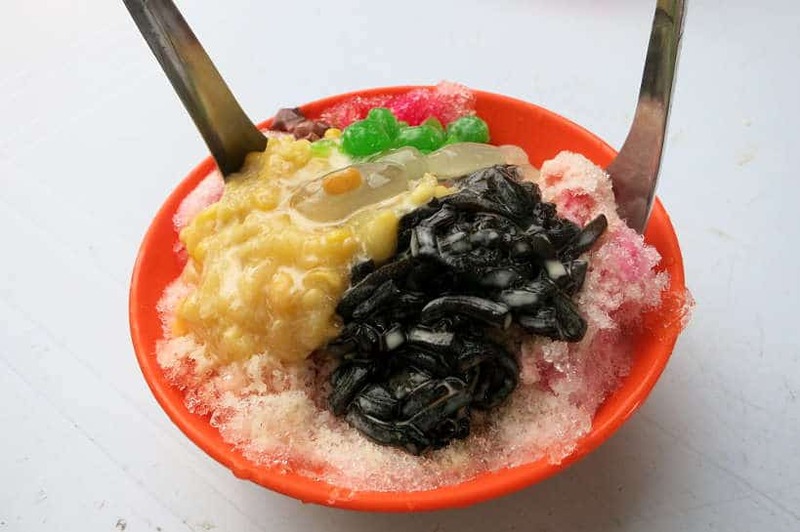 In our previous article, our 9 most beloved Penang foods, we talked about Cendol, a shaved ice dessert with green jelly noodles and more. Ais Kacang was the other unusual shaved ice dessert we came across. The name translates to “ice beans.” Ais Kacang, we learned, was originally made with nothing but shaved ice and red beans. But over the years, the ingredients have expanded. Today, almost every variant has a large serving of red beans, gelatinous balls, sweet corn, grass jelly cubes drizzled with condensed milk or coconut milk, rose syrup over a mountain of ice that resembles the snow peaks of the alps. Each mouthful taken is met with interesting textures, from tender and soft red beans, to smooth chewy bites. Be sure to try this delicious treat and part of Penang’s rich food heritage. Apom is a Tamil dish that comes from Southern India. It is a popular breakfast dish in Penang. And, it is also eaten as a snack in the afternoon or late evening. Apom are like small crepes made of sugar, coconut milk, and rice flour. 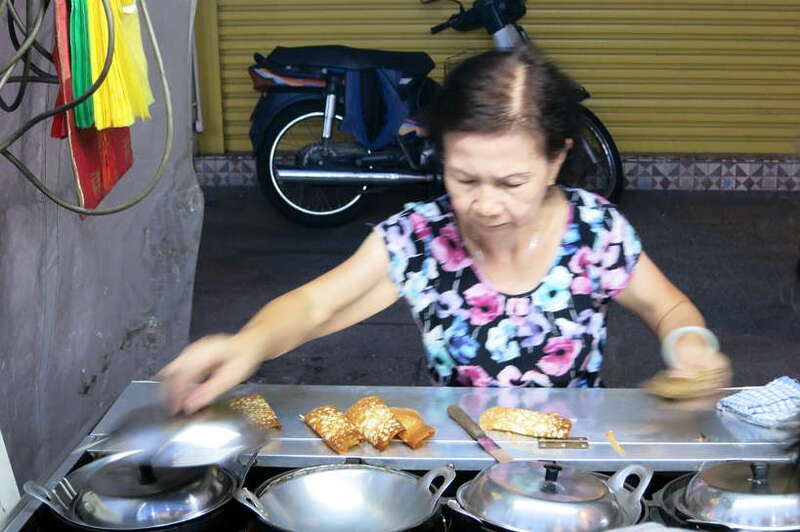 The batter is poured into mini-woks that are used to cook the Apom. 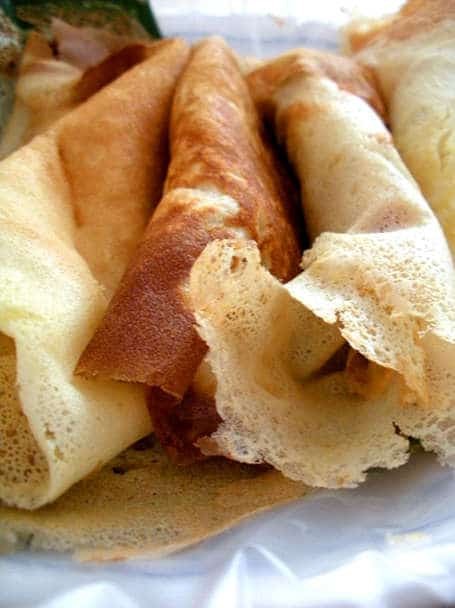 The edge of the crepes are crispy while the center contains more batter and is softer. Some apom called apom manis are made with an extra egg added to the crepe while cooking, and spread on top. It makes for a more filling snack! There are a few stalls serving Apom at hawker centers. We had our apom across the Chulia Street hawker center. We were fascinated by the lady making these mini-crepes in front of a group of hungry spectators. We tried a couple and found them quite tasty. They are soft and easy to eat in two or three bites! A dessert not to miss while in Penang. Address: Across Chulia Street Hawker Center, George Town. Another local favorite Apom stall is located in Pulau Tikus just a few miles north of old town in George Town. We didn’t have the chance to visit this one, it but it is on our list for our next visit to Penang. The vendor cooks the Apom in clay pot with charcoal, which is more traditional way. Hours: Everyday from 6am until 10 am. Closed on Thursday. 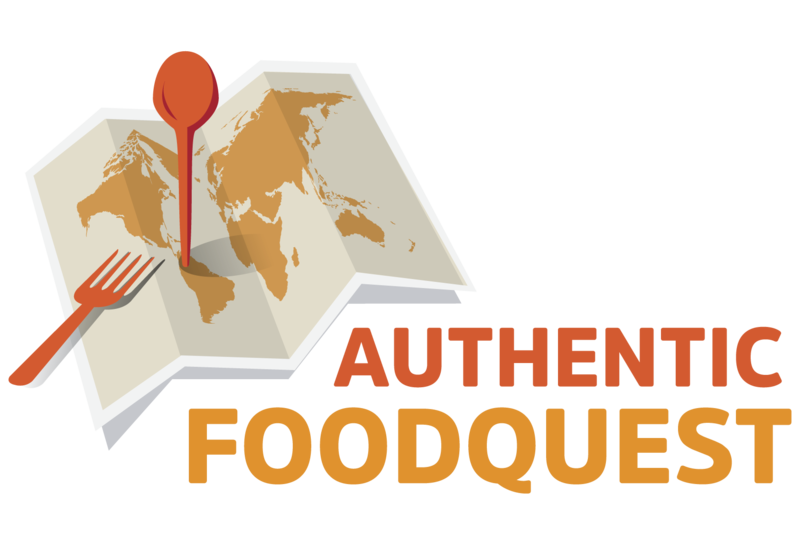 When you travel through the local and authentic foods, not every food you taste will become your next favorite. That’s how we felt about some of Penang famous food. Some of the authentic dishes in Penang were surprising with diverse and very interesting ingredients. The carrot cake for example was unexpected. The heavy sauce in the Chee Cheong Fun was overpowering and the processed meats in the Lok Lok were not tasty. Traveling through food requires having an open mind. Stretching out and trying new flavors and combinations of ingredients. You learn to stretch your comfort zone. And most importantly, you have a deeper experience of the local food scene and culture. Your senses are awakened. Delight yourself in Penang famous food. 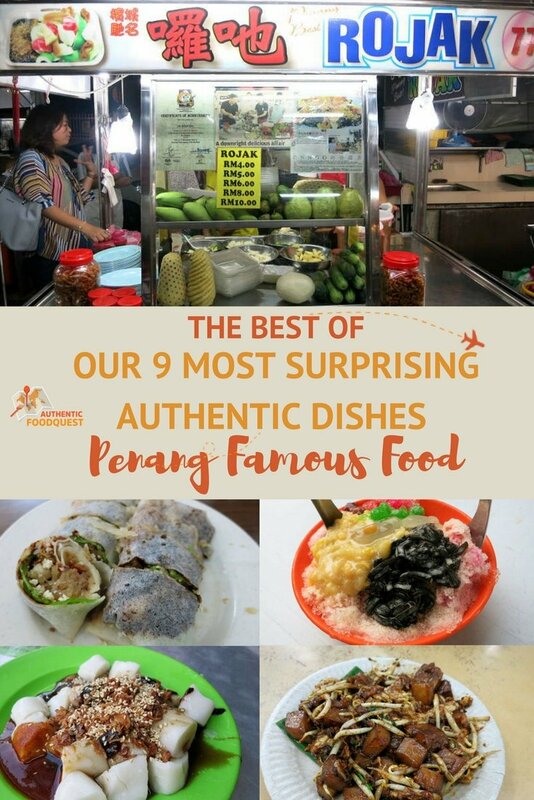 Prepare for a unique food adventure in Malaysia and don’t miss the Penang famous food and opportunity to expand your palate. On your travels, have you tried any local dishes that surprised you? Could be unique flavors or combination of ingredients? In the comments below, share that experience with us. Hi Meagan, discovering Malaysian cuisine was new for us as well. We were seriously delighted by all the delicious local foods. There are so many options of tastes and flavors as well as veggie and non-vegetarian options. If you get a chance, do try Malaysian food and be prepared to be blown away! Cheers. Awesome, Noel that you are already familiar with Malaysian cuisine. Do you have a favorite dish? 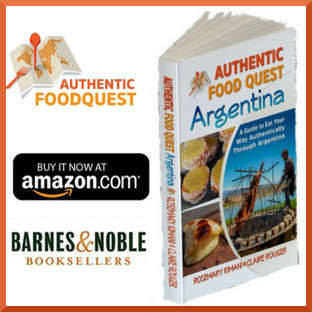 Indeed the cultural influences do make for incredible tastes and flavors. Thanks for stopping by! OMG! I’m so craving for all these dishes now! I completely forgot that they also speak Hokkien in Malaysia, which is pretty close to Teochew dialect (my mother tongue), and was thus so surprised to read about Chai tau kway! It’s one of my favorite dishes that my mother cooks (I’ve actually never had them in a restaurant or at a food stall!). Also, I’ve never tried the Malaysian style Cheong Fun, and would love to taste them one day! Thanks a lot for sharing this post, Claire! 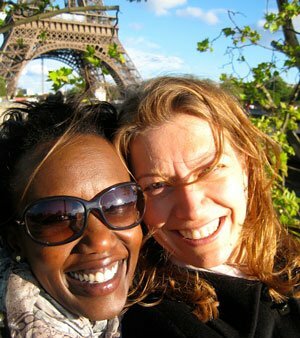 Wonderful and so happy to read that this article invoked memories from your past. Lucky you that your mom makes char kway teow…this was one of favorite dishes and it’s so nice that you grew up eating it homemade.Indeed the food in Malaysia is worth exploring deeper. Thanks so much, Mei. Thanks Amit, where have you eaten Malaysian food? It’s not easy to find in the U.S. so curious where you find it. Yes, the street food in Malaysia and especially Penang is out of this world. 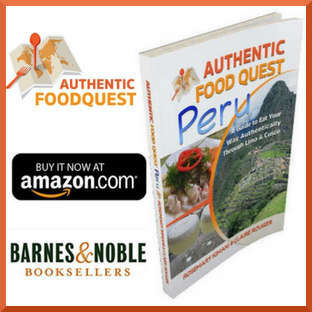 If you have a chance to visit, go…the food alone is worth the experience. Thanks for stopping by. Awesome and so glad that you enjoyed reading about the Popiah. Yes, lot’s of vegetarian-friendly options and they are all delicious. Thanks Siddhartha for stopping by. 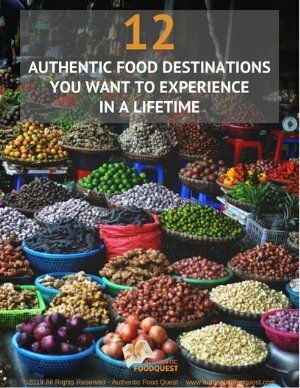 A great guide to finding authentic food in Penang, thank you. The Nasi Kandar and the Lok Lok will definitely go down well with me. I am amazed at how cheap the food prices in Malaysia are. The quality of the food for the price is simply incredible. Many of the dishes are prepared by vendors who have been cooking the same meal for many years. As a result, the quality is amazing. 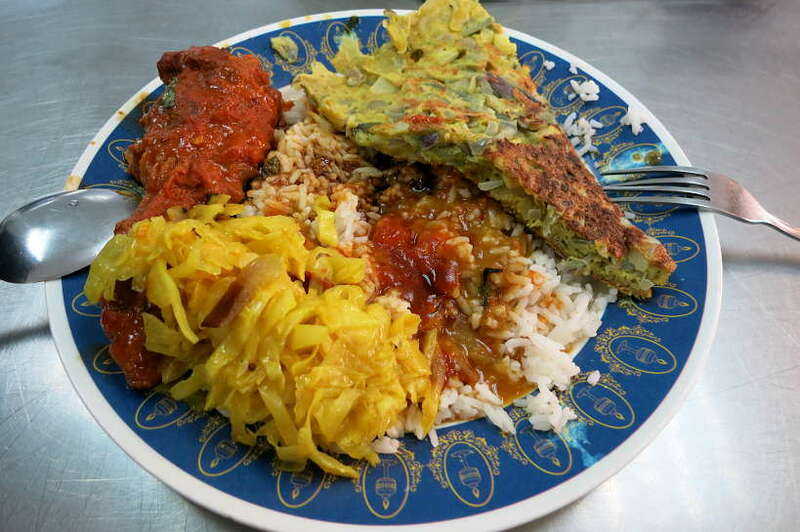 The options at both Nasi Kandar restaurants and Lok Lok are fun to try and experiment. Thanks so much Linda for stopping by. I love reading your posts about Penang food. Sadly, my stomach is rambling in protest – looking at the pictures is not the same as actually eating ;). I read both parts of The Best of Penang Food. Very impressive! I am curious though that you haven’t mentioned fried oyster omelette (if I missed it somehow – please, forgive me). Arguably, Taiwan is the best known place to taste it, but Singapore and Penang have their own varieties of this dish. In my experience, in Penang it is fluffier and more moist than their Taiwanese sibling. Among other places, it can be found at New Lane Hawker Center. Cheers! Thanks Elena and really appreciate your comments about the food in Penang. We didn’t talk about the fried oyster omelette mostly because we talked about it in Thailand and in Singapore. We wanted to focus on new dishes we were discovering for the first time. However, you do make a good point, that any visitor to Penang should also try the fried oyster omelette. We’ve not made it to Taiwan yet, but it is on our list of places to visit for the food…and we’ll make the Taiwanese fried oyster omelette the first dish we try 🙂 Cheers. Thank you Awogor. So glad you enjoyed reading the article. Love how you have shared the details of each of these! Carrot cake really was a surprise on the list. Just when I thought, okay, this must be good, my thoughts were busted when you said they are not made of carrots! Being an Indian, Apom is very familiar to me though 🙂 Your post reminded me of my food trails in the Philippines! 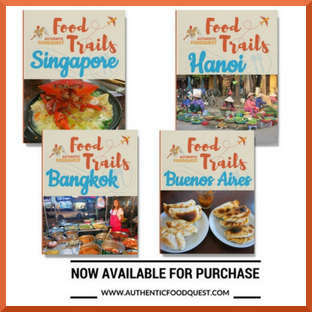 Thanks, Reshma and glad the article reminded you of your food trails in the Philippines. Did you have any similar dishes? We found the food in the Philippines to be quite different from Malaysia. Curious about your thoughts. Ahhh, so Apom is in India as well? We can’t wait to explore the food in India. Yes, it’s funny that carrot cake has no carrots in it! Cheers. I have never had Malaysian food and each dish looks very colourful and inviting. I love Asian street food there is always love put into it and you can tell cooking for people is their passion. Thanks for the tips might be in Malaysia soon thanks for the tips! So glad you enjoyed the article, Lisa. Discovering Malaysian food and specifically in Penang was a real treat. Hope you can visit Malaysia soon and taste all the wonderful food the country has to offer. Thanks for stopping by.